Alpine Skiing is practiced worldwide and features seven disciplines: Downhill, Slalom, Giant Slalom, Super-G, Super Combined, Team Events and most recently Snowboard. Athletes combine speed and agility while racing down slopes at speeds of around 100 km/h. Competition accommodates male and female athletes with a physical impairment such as spinal injury, cerebral palsy, amputation, «les autres conditions» (other conditions) and blindness/visual impairment. Skiers with blindness/visual impairment are guided through the course by sighted guides using signals to indicate the course to follow. Some athletes use equipment that is adapted to their needs including single ski, sit-ski or orthopedic aids. IPC Alpine Skiing acts as the International Federation for the sport which is coordinated by the IPC Alpine Skiing Technical Committee. Six events are on the Paralympic Program: Downhill, Super-G, Super Combined, Giant Slalom, Slalom and Snowboard which will make its debut at the Sochi 2014 Paralympic Winter Games. Each athlete completes one run down the course with their finish time determining the final order based on ascending time. Athletes ski down a long, steep course and must pass through a relatively few number of gates. If athletes miss a gate, they are disqualified. For weather, safety and other reasons, the jury can decide to have two-run downhill if the vertical drop does not comply. Each athlete completes two runs on the same day on different courses. Times from the two runs are added together to determine the final order based on ascending total time. It is a technical event over a shorter course than other events but with a high number of gates that the athlete must negotiate. If athletes miss a gate, they are disqualified. Each athlete completes two runs on the same day on different courses. Times from the two runs are added together to determine the final order based on ascending total time. It is a technical event with a longer course and fewer gates than the slalom. The number of gates is determined by the vertical drop of the course. If athletes miss a gate, they are disqualified. A combined competition which represents the final result of two disciplines — usually one of either a Downhill or Super-G and a single run of Slalom. Each athlete completes two runs on the same day on different courses. Times from the two runs are added together to determine the final order based on ascending total time. Each athlete completes three runs down the course with their finish time of their best two runs determining the final order based on ascending time. There is only one rider on the course at a time. The event takes place on a man-made course constructed from a variety of terrain features like bank turns, various types of jumps and rollers etc. The first documented Championships for skiers with an impairment were held in Bad Gastein, Austria, in 1948 with 17 athletes taking part. Since 1950, events have been held around the world. The introduction of sit-ski allowed people in wheelchairs (paraplegics and double above-the-knee amputees) to begin to ski and race. The first Paralympic Winter Games took place in Örnsköldsvik in Sweden in 1976 and featured two Apline disciplines — Slalom and Giant Slalom. Downhill was added to the Paralympic program in 1984 in Innsbruck, Austria, and Super-G was added in 1994 at Lillehammer, Norway. Sit-skiing was introduced as a demonstration sport at the Innsbruck 1984 Paralympics and became a medal event at the Nagano 1998 Paralympic Games. The Paralympic sports program in alpine skiing includes all kinds of events taking place at the Olympic Winter Games: downhill, slalom, giant slalom, super giant, and super combined. 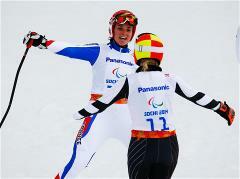 For the first time in the history of the Paralympic Games, in 2014, Sochi will host snowboard cross. Para-Snowboard is included in the program as one of the types of alpine skiing competitions. Alpine skiing was one of the first to develop among athletes with disabilities - in 1948, the first tracks were prepared. The first documented Championships for skiers with an impairment were held in 1948 in Bad Gastein, Austria.